If you are squeamish it might be a good idea to read the first half of this post and miss the second. On the other hand, you might like to test yourself; to find beauty where you might not usually look. I've called this post a walk but the creatures I was looking for were coy so I had to walk the route several times before I could write a post. But it was the same route each time so I hope that counts because everything I saw could have been found on any one of these several days - even though they weren't. Got it? But I woke up one morning thinking I'd like to look for insects. There was no particular reason for this any more than one might wake thinking 'I'd like fish and chips for lunch today'. Or 'I'd like to go to the South of France for my holiday this year'. Some times things just come into one's head. Insects came into mine. Here's a bee heading towards one of the blackberry flowers. Got one! 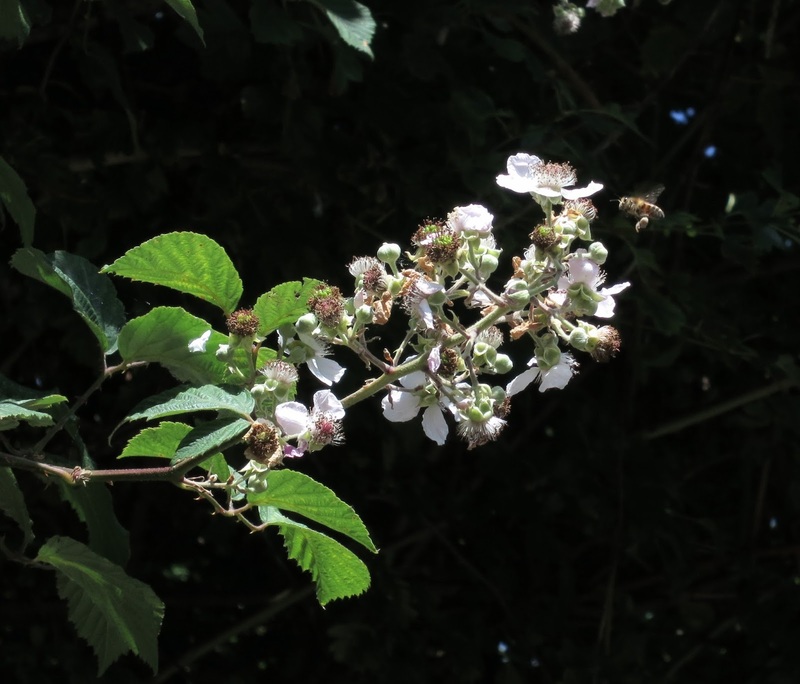 First up - bees on brambles. They were high up. It was only because they were buzzing that I found them. And because they were high up I had to extend my lens to its fullest and hope for the best. I don't think I've mentioned before that I wear glasses. I can see the screen on my camera and I can see the plants and insects I want to take pictures of but not at the same time. So I have to alternate between having my glasses in front of my eyes and pushed up on my forehead. This has been going on for a while so they're now loose and wonky and fall down unless I hold my head at an awkward angle. Sometimes I can solve this by pointing my finger, focusing on whatever's near it and hope it's also focused on what I want to 'capture'. 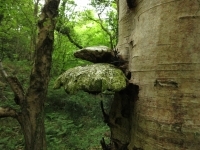 And if I'm not careful they fall onto my nose with a thump - which knocks the picture out of focus. Perhaps that's why I like photographing insects. There's a huge hit-and-miss-ness about it that it that makes it a special joy when something comes out straight. Then there's the equal hit-and-miss-ness whether the insect will stand still or fly away. I don't specially like butterflies. They are too pretty. No matter. They are insects and were there. Sort of. There weren't many and they kept flitting irritatingly from flower to flower. I know this is what they are supposed to do and it's all very poetic of them . . . but focus . . . and they were gone. Up and down go the glasses. Not only that, they were intent upon chasing each other all over the place. Couldn't cope with that, glasses or no glasses. Today a traffic light has gone wrong in one of the villages. But on the 15th of June one of its top headlines was designed to instil fear even into the bravest of the brave. 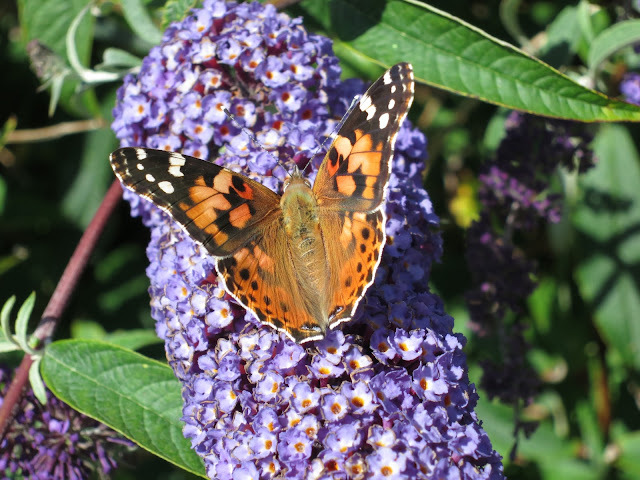 'Dorset Braced for Mass Influx of Painted Lady Butterflies'. I didn't know how to brace myself but did my best. When the buddleia flowered (they like buddleia) I set out bravely and bracedly to see them in their thousands. The views above are of the front and back of the only one I found. 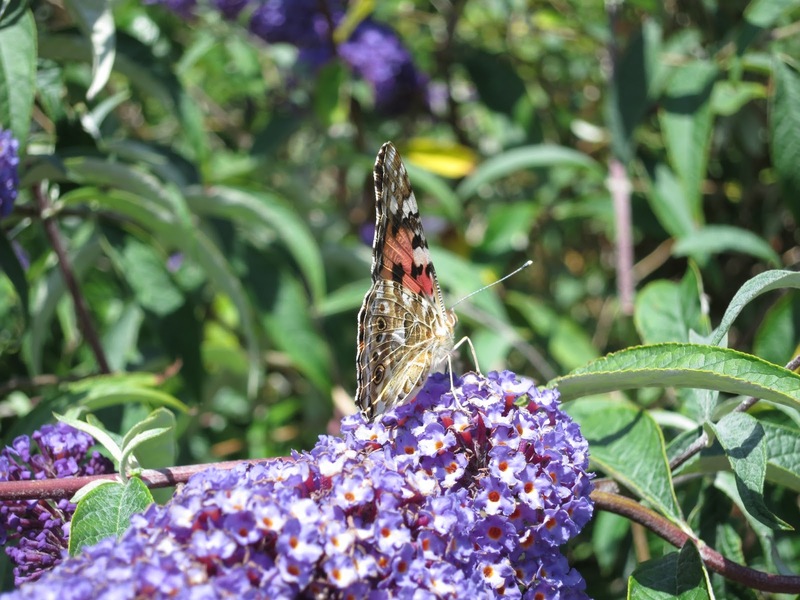 Butterflies at present don't seem to like being seen in public. 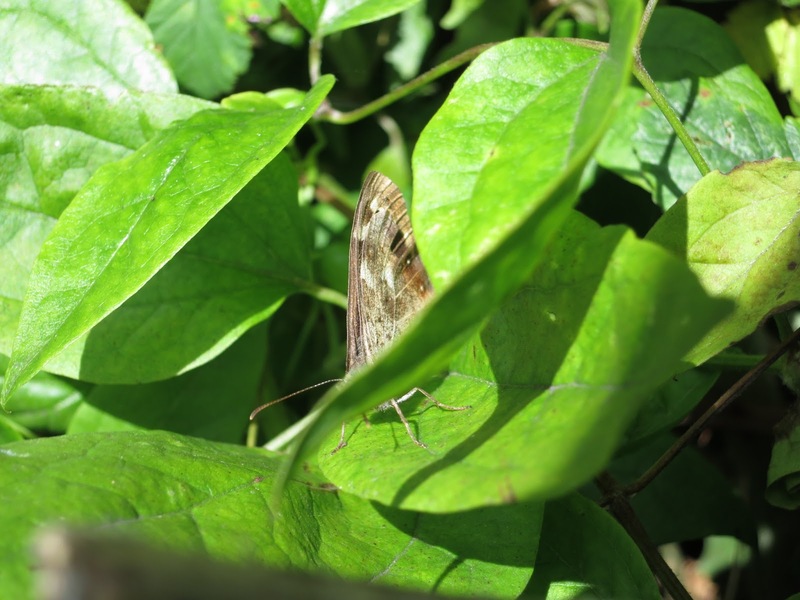 Here's a Speckled Wood hiding in the wild clematis. I found not one but more than thirty washed up on a beach. Blow butterflies - I've not seen jelly fish before and these were all over the place. Large ones, small ones, fresh ones, disintegrated ones. Oh horror! Hyperbole, it seems, is not the preserve only of our local paper. According to the Daily Telegraph this is an invasion. The south west coast is under siege from them. Millions of them are descending on us. (Falling out of the sky?) Thousands are on their way. And terror of terrors they multiply! We are now preparing ourselves, bracing ourselves, putting on our armour and going to classes about how to be psychologically strong . . . for Leather Backed Turtles which feed on the Barrel Jellyfish are likely to follow. Oh the terrors of completely harmless nature! And finally . . . even squeamisher . . . more readers might here like to depart . . .
. . . when I reached home at the end of my walk I found mouse entrails (the bits cats don't eat) on my doorstep and crowds of green Blue Bottles feasting on them. This is where digital cameras come into their own. My usual reaction would be to wave away the flies and dispose of the entrails. This time though I knelt beside them and photographed and photographed and found them to be the most beautiful insects imaginable. Forget butterflies! The colours! - the greens and golds; their spiky bristles! (no doubt called something else); the clear wings a fairy would be proud of. I have become a fan. I hope those of you who have braved to the end of this post will be converted to them too. Loose and Leafy Readers Are Converted to the Colours of Disgusting Flies! An Opportunity to Stick Your Foot in It! Stand still and see what you can see. I had the same problem as you trying to photograph a dragonfly which seemed to wait for me to start focusing and then fly off. 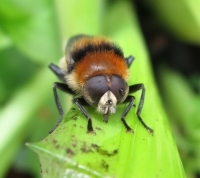 Didn't get that picture but did manage a bee (final picture in this post: http://in-my-playroom.blogspot.co.uk/2015/07/beggars-knoll-chinese-garden.html). 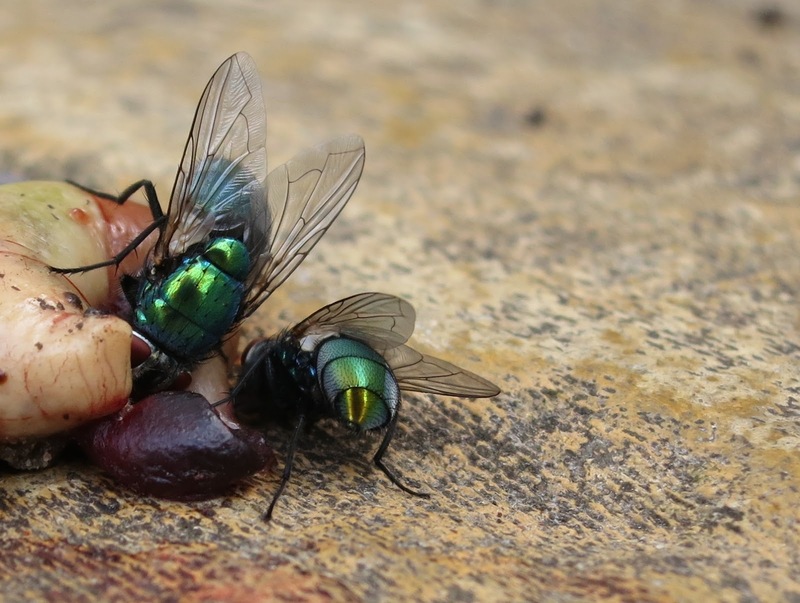 And yes, the flies are beautiful. 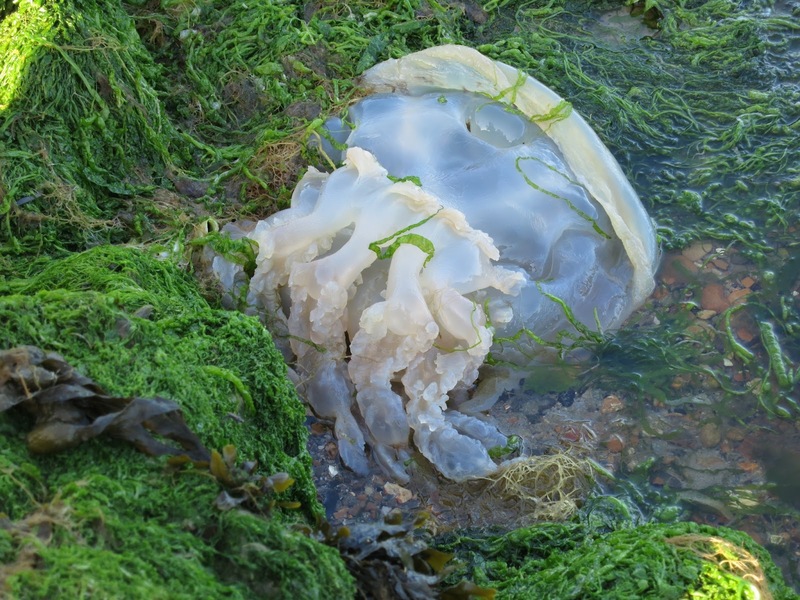 You may already know this but they are asking people to report sightings of jellyfish in UK waters, even the ones that are stranded. Surely after the fly/mouse entrails picture the headline should be "Loose and Leafy readers brace themselves for the next post"
Saw a dead pigeon in a gutter two days ago - must go back and see if there are any entrails and flies. 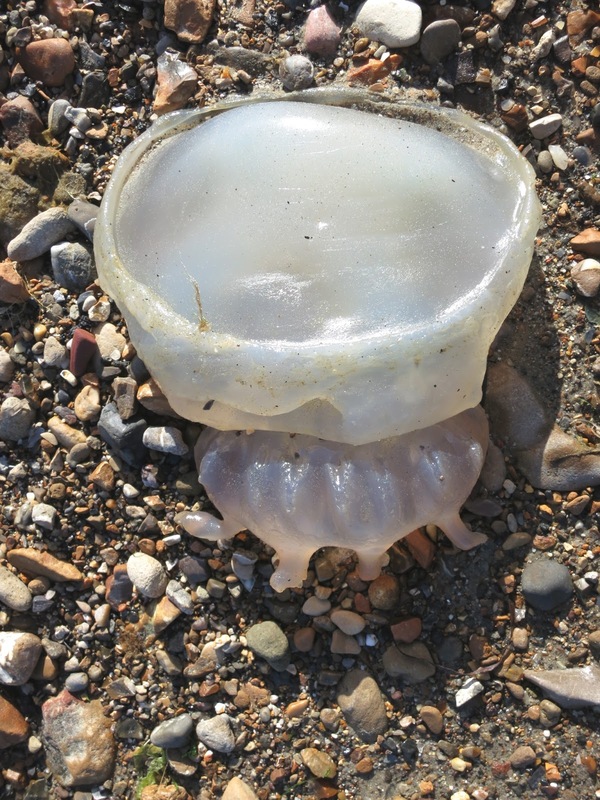 That first jellyfish looks like a condom. Am I OK to say that? As for the media, as part of it I despair. Latest annoyance is the fuss about giant hogweed. Also my online colleagues treating flying ant day (which I love) as a shocker and panicking about bee swarms in the city centre. Are young people today so out of touch with nature? The jelly fish invasion even made the news here in land locked Worcestershire. I guess its a warning in case we go on holiday by the sea!!! What a wonderful post Lucy, you certainly managed to make me giggle as well as educating me.